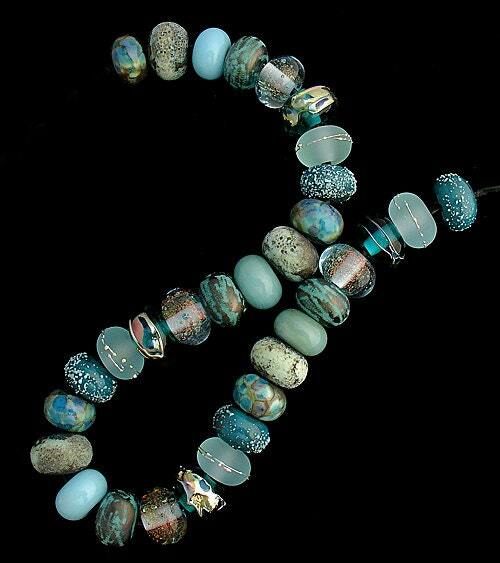 "Little Mermaid" A beautiful OrGaNiC set of 32 glass beads made in shades of aqua and teals. Accents include silver glass, dichroic (sparkle glass) and pure silver wire. Measurements are roughly .50" (12 mm) in diameter for each round. Keep in mind that this is a made to order set and because so it will be unique but similar to the pictures. Please give me 2-4 weeks to finish your beads. If I need to order any special items for your beads, then that may increase the time frame. These beads are absolutely beautiful! 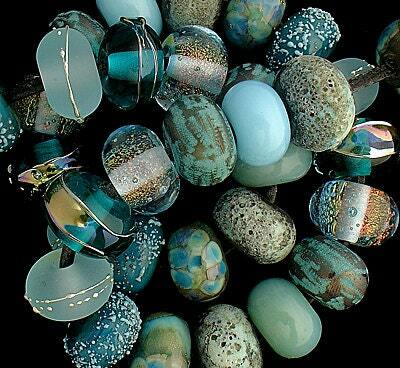 These are completely beautiful beads. Wonderful workmanship! 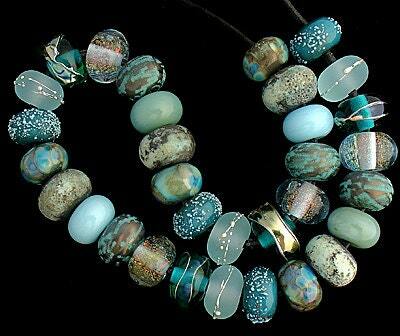 These lamp work beads are so lovely -- and so many wonderful colors! Thanks so much, Debbie! Debbie Sanders makes the most wonderful glass jewels. It may seem a lot of % for a whole strand, but when you do the math you will see they are very reasonable in price and well worth the investment. The photography is excellent too! The best I have seen. They came out of the package looking like what I had ordered in color, tone, and size, which is not always the case with some artists.